This intuitive and easy to use TradingView chart provides real-time Forex and, either real-time or delayed Commodities, Stocks, Indices and other data. - On the right you will find a Watchlist. We added the most popular currency pairs as well as indices, commodities and stocks there. - Right under the Watchlist you will find Headlines and StockTwits (if provided) for a symbol you choose. - You can change symbol either by clicking on any symbol in Watchlist to load chart, StockTwits (if provided) and Headlines, or by clicking the current active symbol in the top left corner of the chart: e.g. EURUSD, and starting typing another symbol instead. - To the right of the Watchlist, Stocktwits and headlines window you will find Tools. You can swith to Hotlists, with US Exchanges Volume gainers, Percent change gainers and Percent change Losers. The other useful tab under the Tools are the Economic and Earnings calendars. Need to save your chart? Click the camera button to receive a shareable image URL that you can post on Facebook, Twitter or elsewhere. Want some additional features to make your charts even more informative and useful? 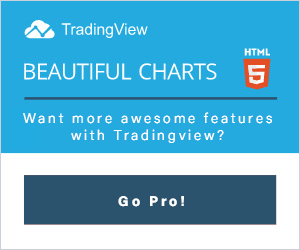 Read more about signing up for a Tradingview Pro account!